I worked as a dishwasher, and for 10 hours a day (12 at first, until I picked up speed), cleaned every plate, pot, and pan dirtied in a day’s work. During crunch times, I was inevitably called upon to re-supply the cooks with huge cartons of eggs, or dump crates of oranges into the juicing machine. Once in a while, to the call of “Pot Pan” (Bette’s shop-talk for potato pancake) yelled back from the grill, I was pressed into action to shred potatoes to order for plates of Bette’s potato pancakes. 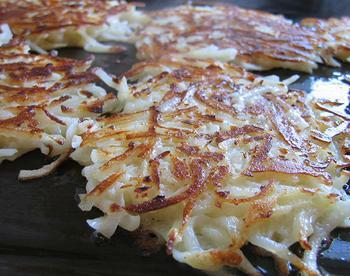 The pancakes were based on the Kartoffelpuffer, a German potato pancake that was a childhood food of Bette’s husband (and Bette's Diner co-owner), Manfred Kroening. Made mainly of shredded potatoes, with a small amount of minced onion, and just enough egg and flour to bind the potatoes together, these potato pancakes were a revelation. The flat nests of potato strands had an incredibly crunchy exterior, yet remained soft inside. Golden brown, crispy, and (relatively) grease-less, Bette’s latkes were in complete contrast to the ones most of us grew up with. 1. Mise en place. Just as in the restaurant, have all of the ingredients ready to go before the potato shredding commences (peel the potatoes, mince the onions, and get the egg mixture ready [see #2]). To prevent the potatoes from browning, they may be peeled in advance and kept covered with water, but once they are shredded, you must work fast. 2. Beat the eggs and flour together. This is how it was done in the restaurant, despite what the recipe indicates. 3. The miracle of the oil. When frying, use a generous amount of oil. I use peanut oil, which will not burn during the cooking process. 4. The miracle of the food processor. A hand grater works perfectly well, but you can also save time, and your knuckles, by using a food processor with the grating blade. 5. Squeeze, squeeze, squeeze. Squeeze as much liquid out of the shredded potatoes as possible, pressing them against the side of the bowl to release their starchy water. 6. Serve immediately. Though I’ve never tried to keep them warm in the oven, I fear that this might lead to a fall-off in crispiness. 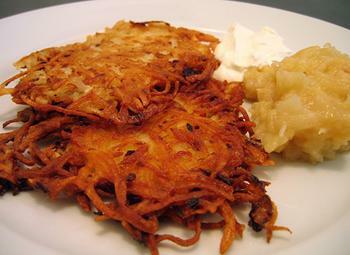 Applesauce and sour cream are the classic accompaniments to potato pancakes. For a spectacular condiment, try skipping the jarred applesauce and making your own. In a large pot, melt three to four tablespoons of butter and a quarter cup of sugar (to taste). When the butter and sugar turn a light golden color, add eight to ten apples that have been peeled, cored, and cut into small cubes. Add a squeeze of lemon juice and cook the apples under medium heat until soft (20 to 30 minutes), and all of the liquid has reduced. This amount of apples will produce approximately 1.5 quarts of applesauce. The applesauce may be made in advance. Serve at room temperature. BEFORE AND AFTER Crispy potato pancakes, courtesy of Bette's Oceanview Diner, from griddle to platter. Those Kaftoffelpuffer look great! Next time I make them at home I'll no doubt overcome my laziness and squeeze the potatoes, great tip. Mmhh... maybe putting them inside a musslin sloth would work even better, have you ever tried? From personal experience: yes keeping them in the oven leads to a dramatic fall-off in crispiness. Oh that's how you make potato pancakes! Thanks for the tip. I could never figure out how to get them so they weren't soggy. omigosh! Those are my family's luxuriously lazily fattening Sunday breakfast potato pancakes! Awesome! Same recipe and everything. Interesting suggestion about wrapping the potatoes up in muslin to release the liquid. A step-by-step for another recipe on epicurious demonstrates the use of a towel. (into which you've squeezed half a lemon over a small strainer.) This helps keep them from discoloring. over a large stainless mixing bowl. (The potato strands, in spite of their small caliber, do not fall through.) I dumped the water 2 or 3 times over 10 minutes. Then I mixed the remaining potatoes with the standard egg, grated onion, flour, salt and pepper amounts. I fried them in a cast-iron skillet, which makes a much better product than any other kind of pan. They came out browned and crispy outside, and soft inside, as I remember my grandmother's best. We had applesauce, because that's how my husband grew up, but in our family we served them with clear gravy (chicken or beef) from the paternal (Russian) side, and sugar from the maternal (Polish) side. Incidentally, my grandmother had a friend in Chicago who used to make giant latkes - 5 or 6 inches in diameter. They came out just as good as the silver-dollar sized ones my bobbe made. I will try Bette's recipe and let you know how it compares. Thanks for the tips, Leigh. Submerging the grated potatoes in water and straining them en masse sounds like a great time-saver. I've never heard of eating them with gravy or sugar, just the usual applesauce and sour cream. Mine were about 2-3 inches in diameter, but the ones made at Bette's in the restaurant were larger, around 5 to 6 inches. finally did it and got an outrage reply from an old friend in Germany. says that the way i did it is not the REAL kartoffelpuffer. having said that, i'm badgering him for the recipe from his missus. and come to think about it, the grated bits doesn't look like the kp that i had in germany back in 99. i remembered it (after GREAT difficulty) that the potatoe bits were in small cube form. You made a valiant effort. I think you and your granny may have served the world's first potato latkes with chili sauce! Those are very very good potato pancakes I have had them for a number of years during the chanauka season. HI: I keep reading about these pancakes. Where can I get the recipe to make them? Thank you. This is similar to the recipe we have used here in Australia for many generations. We have always added a little shredded meat (any type), and eaten the potato pancakes as a main course with tomato sauce or gravy. Great tips and suggestions! The potato pancakes turned out great! I finally feel like I could serve these to guests! Thanks! These were out of this world -- exactly what I was looking for tonight - crispy and delicious, the guys LOVED them! Thank you! Just made them and they are really good. I am collecting any recipe which can be used simply when sailing. This one is going in. Incidently someone wants to know their history: I do know that they were often served to German U-Boat crew as a treat. 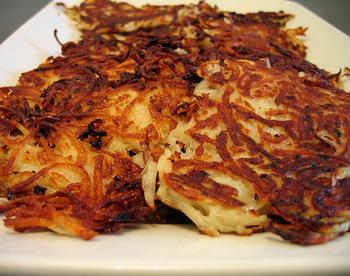 i was born and raised in cologne germany were potato pancakes were the main meal on friday nights. no meat because most people were catholics. served with the potato pan cakes was genuine pumpernickel bread,applesauce and beer. Hmmm, actually with this recipe, we could also use sweet potato. It's sweeter and it's crispy. I always do it to make snacks. Maybe I am blinder ( not really a word, but) than usual, but I have clicked on both links , in the article and the comments.. I cannot find the potato recipe. Why am I missing it? Is it really there in one of the links? You're not a blinder. It looks like the original page I linked to disappeared. This is inexact, but 1.5 potatoes (shredded) should be good for 1 entree-size serving per person; whisk together about 1/2 an egg and a tablespoon of flour and combine with the potatoes and about 2 tablespoons of minced onions. That's the basic mixture. Sorry the original recipe disappeared! I use a colander submerged in a sink full of water to shred my potato into. I swish the grated potato around well, then drop the sink water & refill to rinse with fresh water. Then I pat dry with paper towel or a clean teatowel. I use a mandolin style shredder that makes thin straws, as opposed to a grater.